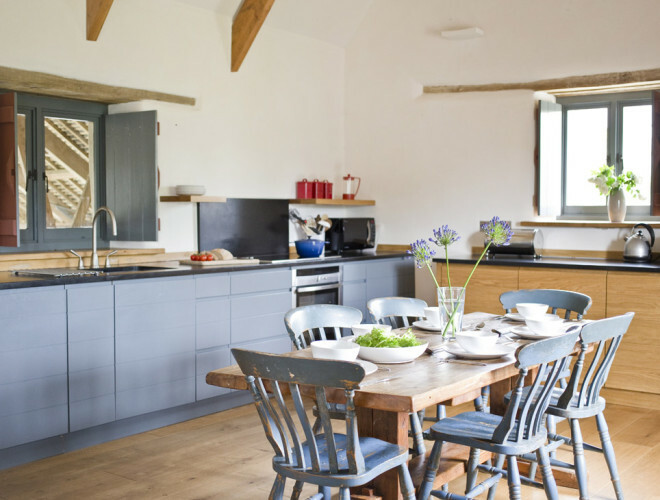 Mowhay Barn is a stunning reverse-level contemporary barn conversion that has been created with inspiring holidays for families and friends in mind. Hundreds of years of history has been lovingly folded together with up-to-the minute contemporary features to create a living space that simply makes you feel good, from the moment you step in. And outside you can choose between relaxing in your own sunny garden, wandering through into the sculpture garden of next-door Kestle Barton art gallery, beyond to the meadows and orchards, or a little further down footpaths to beautiful Helford village or romantic Frenchman’s Creek. You are also close to the famous Helford River, its woods and creeks, and the beaches of the Lizard Peninsular and Falmouth Bay. Inside you find a large open-plan kitchen and dining area, opening high to a beamed ceiling. 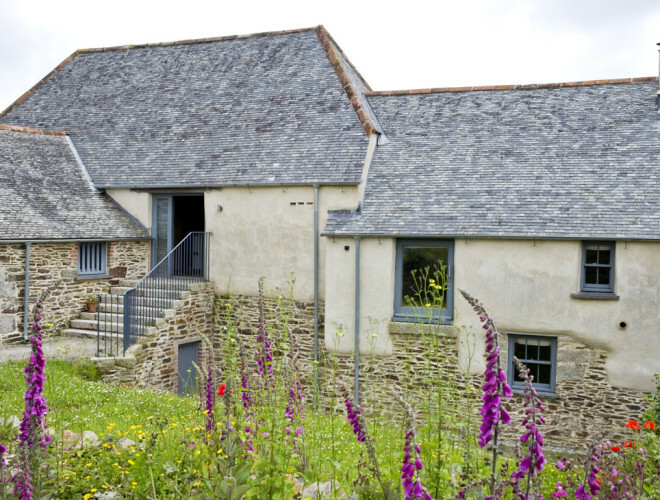 It is generously equipped with the things you’d expect like electric cooker, microwave, fridge, freezer, washing machine, tumble-drier, dishwasher… but also original artworks by some of Cornwall’s best contemporary artists. 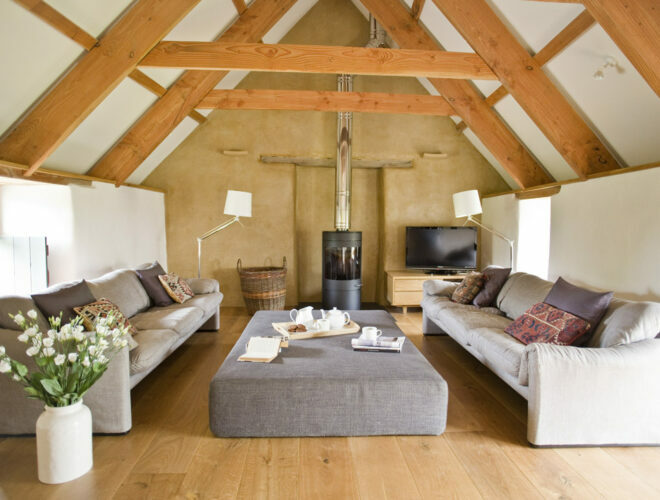 Opposite, and on the same level is the stunning living room, with generous sofas, high roof-beams, polished lime-plaster rendering, beautiful wide-planked oak flooring, and contemporary wood-burner. … where you will find two double rooms, and a twin. Both doubles have very comfortable superking-sized beds, and one has a to-die-for en suite bathroom with double-ended bath and stroll-in shower. 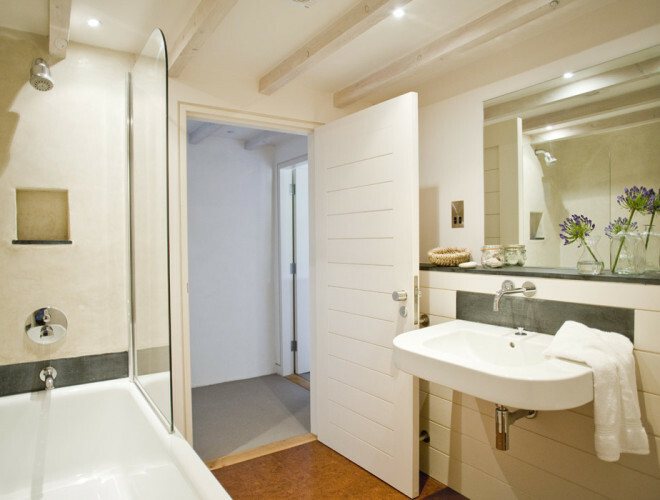 A generous family bathroom complete the accommodation. The downstairs walls tell the history of this building — with hints of an ancient granite doorway here, new heritage plasterwork there… and everywhere a lovely sense of style and space. Open the wooden gates from the car-parking area and step into your own large open storage barn. It’s great for bikes, surfboards and general holiday paraphernalia… and comes complete with a table-tennis table for extra fun when you run out of everything else to do. Beyond this is your pretty garden. It gets the sun all afternoon, and has elegant furniture for al-fresco dining. Beyond is the sculpture garden of the Kestle Barton gallery. During times the gallery is open you will also find your hosts here, so you can always find someone if you need them. You can also get good coffee and often nice baked things. The wildflower meadow and orchard are also all here for you to enjoy. Many of the artists showcased by Kestle Barton gallery have international reputations, and exhibitions change regularly throughout the summer. We love the stunning combination of heritage architecture and contemporary design. Upside-down living in Mowhay Barn is great fun, and the upstairs makes a superb space for families and friends; big enough to find a quiet corner, but all connected together so a good space for socialising too. The setting of Kestle Barton is unique. 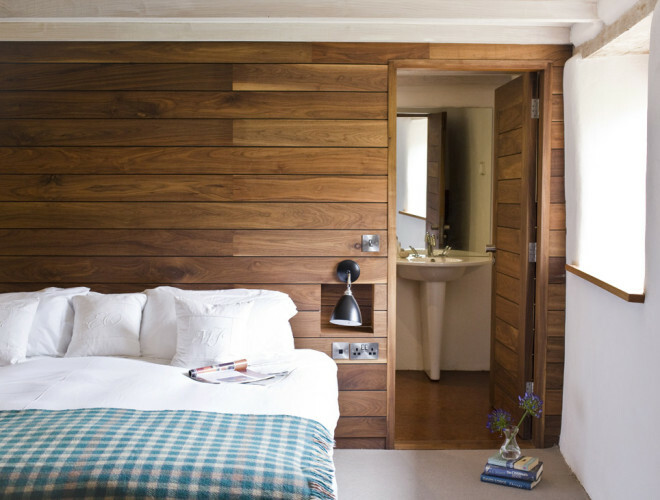 You are staying not only in a beautiful barn conversion, but also in the heart of an ancient farmstead that is now both a haven for escape, and a highly reputed centre for the arts. In turn. Kestle Barton is connected to the world by footpaths that lead to woodland and village, creek and pub.